CENTRAL POINT, Oregon - A flamingo can see much better these days after her vision was restored in a very rare procedure. Catalina is a Chilean flamingo who lives at Oregon's Wildlife Safari. Employees noticed the 32-year-old bird began stumbling around at night and realized she wasn't able to see clearly. They called in a veterinary ophthalmologist who looked straight into Catalina's tiny eyes and knew the little pink lady was suffering from cataracts. Dr. Cassandra Bliss has performed eye surgery on plenty of animals, but never on a flamingo, and never on eyes so small. In fact, Bliss says this is only the second time that a flamingo cataract operation has ever been performed in the U.S.
"It's rarely done in this species. In fact it's only been done one other time in New York. But never on the west coast," Bliss told KOBI. "When you speak to any ophthalmologist we are already using micro-surgical tools. That being said we have different sizes and this is definitely going to be the smallest." The minuscule surgery was a giant success! Catalina will recover for two weeks before being placed back with her flock. Chilean flamingos can live up to 65 years in captivity, which gives the flamingo many more years of eagle vision. Feline corneal sequestrum is an unusual corneal disease unique to domestic cats. It refers to the development of an opaque, dark brown to black plaque on the cornea. This plaque is actually a dead piece of corneal tissue. Sequestra are usually oval to round; they vary in size, from very small to quite large, and can extend deep into the corneal tissue. Corneal sequestration can occur in cats of all ages and breeds. The cause of feline sequestra is unclear. However, development of a sequestrum is often associated with corneal trauma, dry eye syndrome, abnormal eyelid conformation, and/or Feline Herpesvirus infection. Genetics and conformation may also be involved since there is a definite breed predisposition with Persian and Himalayan breeds being frequently affected. Initial signs may be subtle and include signs of pain such as squinting, tearing, and elevation of the third eyelid. As the sequestrum develops the cornea turns from clear to brown or black. Blood vessels may extend from the edge of the eye to the sequestrum. In some cats the cornea surrounding the sequestrum can become infected or the sequestrum is so deep it may involve the entire thickness of the cornea. These cats are at risk of losing the eye. Since sequestra may be painful and can cause irreparable damage, surgical removal of the sequestrum is the treatment of choice. The surgical procedure to remove a sequestrum is called a lamellar keratectomy. This surgery is performed using an operating microscope, micro-surgical ophthalmic instruments, and with the patient under general anesthesia. A conjunctival grafting or corneal transplant may be recommended. Long term artificial tear supplementation in both eyes is recommended to prevent recurrence of the condition as well. The prognosis for the eye to be free from pain and have normal clinical vision is good with surgery, especially if the sequestrum is removed at an early stage. However, sequestrum formation is the way an individual cat responds to corneal irritation, and additional episodes may occur in one or both eyes in the future. To help prevent any recurrences, notify your veterinarian or veterinary ophthalmologist immediately if any new eye injuries occur. This is an important disease that cause blindness without the appropriate treatment. Pictured is our patient, Maddie, who came in almost blind and then after only 2 weeks of treatment her eyes are already looking much better and she is catching a ball again!. Read more about this disease below. What is Chronic Superficial Keratitis (CSK)? CSK (also referred to as pannus or degenerative pannus) is a slowly progressive disease of the canine cornea, characterized by pigmentation, vascularization, and opacification. There is also a form of this disease which affects the third eyelid called plasmoma. CSK is seen predominantly in the German shepherd dog and greyhound, but sporadic cases occur in other breeds as well. The exact mechanism is unknown, but several factors are involved. The fact that certain breeds are more prone to the disease suggests a genetic predisposition. Ultraviolet (UV) radiation plays an important role as an inciting and propagating factor in the disease. In fact, dogs living at higher altitudes where exposure to UV light is greater are often more severely affected. Immunologic factors are also believed to be contributory. An allergic-type reaction to environmental allergens or against the cornea itself may be involved in the disease process. The most common sign is infiltration of the cornea with blood vessels and pigment. This gives the eye a visible discoloration. The change normally begins at the outside or bottom of the cornea and moves inward. In some cases the pigment can be so severe that it leads to vision loss. Reddening, thickening, and pigment loss of the third eyelid characterize a subclass of CSK, called plasmoma. Plasmoma is often associated with mucoid discharge from the eye. Clinical signs may be enough for diagnosis however it is necessary to rule out other diseases that can have a similar clinical appearance but markedly different treatment. In some cases it is necessary to perform cytology to confirm the diagnosis. A cure is not possible, but life-long medications and prevention of excessive exposure to UV light will prevent the disease from progressing. Common medications include eye drops that control the growth of blood vessels and pigment. These may be steroids or T-cell inhibitors or a combination of both. Initially the drops may be used quite frequently but over time these can generally be decreased to only once or twice a day therapy. Dogs on long-term medications should be monitored to prevent secondary infections. In very severe cases surgery to decrease the scaring of the cornea may be needed in the initial stages of treatment. The condition waxes and wanes throughout life, so periodic follow-up is indicated to ensure that your pet is on the most appropriate therapy. Canine Dry Eye is Serious... We Can Help! We want to share a testimonial for a patient that had terrible dry eye. Meet Chewy! His mom writes: "I truly don't know how to thank you, you are a blessing and I truly mean that. I know I say this every time I come in,it was those 4 simple words," you need a trainer"!!!!! I/we are forever grateful for you and what you do! I have traveled all over the country for the past 8 years since I rescued Chewy and we have seen many veterinarians, and an ophthalmologist in Rhode Island. I know that Grants Pass brought me back here for other things but I'm so fortunate that I found you. You have made my life and his life so much better, I don't have to worry about his eyes anymore which was a big stress!! I truly don't know what else to say but I feel like thank you just isn't enough, so when we leave either in November or February I think you need to pack up and come with us so you can take care of him. Haha Again thank you for you true dedication and compassion that you show to Chewy as well as others!" Keratoconjunctivitis sicca (KCS) or "dry eye" is a condition affecting many pets, most often older dogs. The absence of tears makes the cornea very susceptible to damage. Although it is seen in all breeds some are more prone to developing KCS than others. These breeds include: the American Cocker Spaniel, Dachshund, English Bulldog, Lhasa Apso, Miniature Schnauzer, Pug, Shar Pei, Shih Tzu, West Highland White Terrier, and the Yorkshire Terrier. In cats, the condition is most commonly initiated by feline herpesvirus infection. The condition is a result of decreased tear production and changes in the composition of the tear film. Tear film functions include providing oxygen and nutrition, removing waste products and debris, lubrication to the eyelids, maintaining a smooth optical surface, and providing antibacterial components. inflammation of the lacrimal gland may cause it to be temporarily or permanently destroyed. Viral infections known to cause damage include canine distemper and feline herpesvirus. Clinical signs are often suggestive of KCS, depending on the severity of the condition. Confirmation is achieved utilizing the Schirmer Tear Test, which uses a small strip of sterile filter paper to measure tear production. Normal tear production is generally considered to be between 15 and 25 mm in a minute. The ultimate goal of therapy is the return of normal tear function. Frequent supplementation with a long-lasting artificial tear is necessary until tear production increases. Topical eye drops such as cyclosporine or tacrolimus are used to stimulate the lacrimal gland to produce tears. These drugs are very effective but are only helpful as long as they are being used. After the initial diagnosis of KCS, topical application of medications may be frequent, but the frequency is decreased as the pet begins to respondto treatment. Although the majority of KCS cases respond well by increasing tear production, the occasional case does not. In such cases frequent medical therapy in the form of an artificial tear every few hours is required on a life-long basis. KOBI Covered our open house! Click the link below! Thanks to the City of Central Point Chamber of Commerce for helping us celebrate with a red ribbon cutting. New Hospital!! Opening In April! Clients & the public are invited from 5-7 pm April 13th. Dave Siddon waited anxiously as Phoenix the golden eagle was put under anesthesia and draped in cloths until only his eye and tail feathers were showing. "It scares me to death," Siddon said of the cataract surgery the 35-year-old bird was about to undergo in Medford. "I love this bird so dang much. It's like he's my child." Found by a logger on a remote road while still a fuzzy eaglet, Phoenix has called the Wildlife Images animal center outside Grants Pass his home for decades. He is too dependent on humans and deeply bonded with Siddon, the center's executive director, to be released into the wild. Working in a darkened surgery suite at Southern Oregon Veterinary Specialty Center with a light illuminating Phoenix's eye, animal specialty ophthalmologist Dr. Cassandra Bliss began the delicate procedure of cutting into the eye to reach the clouded lens obscuring the eagle's vision. Six months ago, Phoenix's vision began to deteriorate, and staff members at Wildlife Images noticed fogginess in one eye, Siddon said. "It progressed much quicker than we expected," he said. Without vision in his eye, Phoenix would have had trouble finding his food and landing on his perch. Eagles that can't see correctly have difficulty flying, Siddon said. "They crash and burn, and their feathers break," he said. Siddon said he couldn't stand by and watch the eagle's quality of life deteriorate. The bird serves as an animal ambassador for Wildlife Images, educating the public about wildlife and appearing in films and on television. Phoenix also has a one-of-a-kind personality. "He has the whole package," Siddon said. "He's very bright and adaptable. He's got a great attitude. I've worked with hundreds of eagles in my life, and we've formed a bond." Phoenix is known to play favorites with his human handlers. "An eagle's talons are as strong as a leopard's jaws. They can literally break bones," said Siddon, who dons a large protective glove so Phoenix can perch on his arm. "He doesn't clamp down on me. Some people he doesn't like, and he will go after them. There's a person he doesn't like at Wildlife Images, and he will clamp down on her glove." As the surgery continued, onlookers went back and forth between watching the procedure through a window and getting a close-up view via a video monitor in a separate exam room. Bliss removed the cataract from Phoenix's eye and inserted an artificial replacement lens donated by I-MED Animal Health, a Canadian company that was the first to develop replacement lenses for birds of prey. She wrapped up the surgery by sewing Phoenix's eye with a curving needle, then went out to report the outcome of the surgery to Siddon. "The surgery went great," Bliss announced. There were a few hurdles to overcome, especially when Phoenix's eye wouldn't dilate as was needed for the surgery to proceed, but Bliss said she expected the eagle to recover well. She said eagles and falcons can develop cataracts for a variety of reasons, including genetics, injury and age. With no known trauma to his eye and considering his age, Bliss said, Phoenix's cataract was likely age-related. With his sight restored, Phoenix could live well into his 40s, according to Wildlife Images. Bliss said sight is the most important sense for eagles. Their large eyes weigh more than their brains, and they have a mind-boggling one million photoreceptor cells per square millimeter in their retinas. Soon after the surgery, Phoenix woke up and looked around. With Valium in his system to combat the stress of surgery, he left with his human companions for the trip back to Wildlife Images. Bliss will check on him as he recovers over the next two weeks. She said performing the cataract surgery on Phoenix was a unique opportunity. "I've done it on a penguin and hundreds of dogs and cats, but this is my first eagle," Bliss said. Medford, OR— An appearance in a Disney movie and filming with John Denver won’t be the only reasons “Phoenix” the Golden Eagle has earned some fame. This notable golden eagle that calls Wildlife Images home will be receiving a rare cataract surgery and artificial lens transplant on Wednesday, February 3, 11 a.m. at Southern Oregon Veterinary Specialty Center in Medford. The surgery will be performed by animal specialty ophthalmologist, Dr. Cassandra Bliss. “Thanks to the generous donation of the artificial lens by I-MED Animal Health, we will be able to increase Phoenix’s visibility dramatically,” says Dr. Bliss. “His cataract has progressed to the point where he has nearly no sight in his left eye.” Although this won’t be Dr. Bliss’ first specialized cataract surgery and artificial lens transplant, it will be her first on an eagle. Dr. Bliss has performed this unique and highly specialized surgery on multiple dogs, penguins and other exotic species. “I look forward to helping Phoenix get his vision back,” comments Dr. Bliss. Dr. Bliss is a Diplomate of the American College of Veterinary Ophthalmologists, specializing in cataract and microsurgery, eyelid reconstruction and blepharoplasty, corneal repair and grafting, keratoconjunctivitis sicca and tear film management, glaucoma, equine corneal disease and recurrent uveitis. 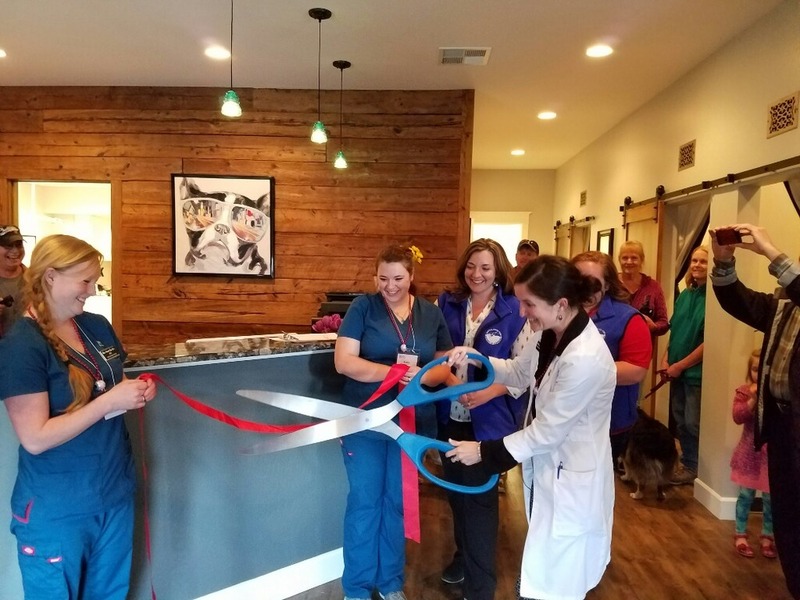 She has been practicing with Southern Oregon Veterinary Specialty Center since November 2014 and operates her own practice, Bliss Animal Eye Care. Wildlife Images Rehabilitation and Education Center is a 501(c)(3) non-profit organization established in 1981. They provide care and treatment for sick, injured, and orphaned wildlife indigenous to the Pacific Northwest, while giving the public an opportunity to experience wildlife first-hand. Wildlife Images receives and cares for over 1,000 animals every year at no charge to individuals or organizations. Wildlife Images is a sanctuary for over 80 permanent resident animal ambassadors such as grizzly bears, black bears, cougars, bobcats, badgers, and variety of birds of prey. The center offers extensive outreach and educational programs supporting their core purpose to involve, educate, and inspire children and adults about the importance of preserving and protecting their natural resources while fulfilling their mission of SAVING WILDLIFE. With over 80 resident animal ambassadors at the center, Wildlife Images does not receive any state or federal funding and their survival is based solely on donations from sponsors and donors. I-MED Animal Health, a division of I-MED Pharma, Inc., is dedicated to improving eye health for all animals. I-MED Animal Health specializes in surgical and non-surgical products that alleviate Cataracts, Dry eye (KCS), tear stains and other eye conditions. In collaboration with ophthalmologists and engineers, I-MED was the first company to design replacement lenses for birds of prey. For more information about I-MED Animal Health, visit www.imedanimalhealth.com. For more information about Southern Oregon Veterinary Specialty Center, please contact Dr. Diana Schropp at 541-282-7711 or visit www.sovsc.com. For information about Bliss Animal Eye Care, visit www.blissanimaleyecare.com. Wildlife Images rehabilitation and education center received a Red-Tailed Hawk with a severe eye injury and new exactly who to call! Kendra Romero, Animal Care team leader from Wildlife Images contacted Cassandra Bliss, veterinary ophthalmologist, of Bliss Animal Eye Care in Southern Oregon to exam the bird. After the examination of the Red-tailed Hawk Dr. Bliss concluded the hawk needed emergency eye surgery. The surgery included the stitching of the laceration in the eye to prevent further damage. After a successful surgery and recovery, the patient was moved to an outdoor enclosure where it could live, and hunt therefore proving it had the strength to be released back into the wild. May 7th, 2015 the hawk was given a clean bill of health and was released Friday May 8th near Wildlife Images in Merlin, where it was found. Neonatal & Pediatric Anesthesia. This is one of the most challenging aspects of our surgery day. These patients are typically very small and the risks of anesthesia are high. Here is Katie with Nixon - her technical expertise and training in our tiny patients is invaluable to our success in microsurgery. We not only have the opportunity to anesthetize these tiny patients regularly, we pride ourselves in the having the latest techniques, equipment, and staff ready to ensure the care of your tiny pets. Adequate air flow - you do not want condensation or sweating inside of the cup and if it heats up this can be a good environment for bacteria, which is not good for healing and preventing infection. Ability to clean thoroughly - cleanliness is key to any wound post surgery! This includes being able to remove and wash any cloth components, ability to sanitize any hard pieces, and ease of disassembly. Stable material. Some eye protection still allows for the "cup" to become deformed, which may lend to additional injury to the eye or area around the eye. If you have any questions about the best eye protection for your horse, don't hesitate to discuss with your veterinarian or Dr. Bliss & her staff. Here is a very short video showing the amazing difference that cataract surgery has on our patients! Does your pet have problems with vision? Schedule your appointment today to see Dr. Bliss and her caring staff. This is a very common question asked of veterinarians and pet lovers alike! Color vision is a complicated system that is affected not only by the wavelength of light (color), but also what cells make up the retina of the animals and how many of those cells perceive light and dark. The world of color vision is animals is fascinating. To help answer this questions let’s start by simplifying the basics of color vision. Humans can basically see 3 wavelengths of light, special structures known as opsins in their retina absorb the specific wavelength. So for the purposes of this discussion we humans have a red opsin, a green opsin, and a blue opsin. Next it is important to clarify a common misconception in order to better understand dog vision. Most so-called color blind people are not truly color blind. They are only missing the ability to see one of the three wavelengths of light. They are dichromats – they see 2 wavelengths of light, either missing the green or red. It is in fact extremely rare for someone to be truly color blind (0.00003% of people!). To contrary to popular misconception, dogs do not see in black in white. Their color vision is comparable to color-blind people. They see two wavelengths of light. In simple terms dogs have blue and red opsins, but lack the opsin that absorbs the green wavelength of light. So what about other animals? Horses have green and blue opsins, so they detect blue and green! Now this doesn’t mean that they cannot see in red, it just means that a red apple appears in a different shade. These nuances of color vision, such as seeing different shades of a specific color, such as pink can be due to the light of the environment. Something may appear dark red at night, but bright red in the sunlight! Also there can be absorbance of different wavelength simultaneously, for example seeing the color purple is the combination of red and blue together. Are any animals truly color blind? Yes! This is usually seen in deep-sea fish, they can only see shades of grey. Interestingly marine mammal species only see in red, which means that for seals, whales, and dolphins, the ocean is not blue! Mail Tribune wrote a very nice piece on the work of Dr. Bliss in the community recently. Two shelter kittens with eye defects will live better lives, thanks to surgeries performed by a local veterinarian and specialist who donated their time. The effort started in early December while Dr. Tami Rogers of Jacksonville Veterinary Hospital was spaying and neutering cats for Committed Alliance to Strays. She noticed that two 12-week-old kittens from the same litter, a male named Seis and a female named Monique, were missing large portions of their upper eyelids because of a congenital defect. Doctor Bliss and team are in the news again today as they assist with a pair of kittens who have a particularly unique need. "Two 12 week old kittens from C.A.T.S. are ready for a happy new year. That's after receiving specialized eye surgeries, pro-bono; the pair were born with congenital eye defects, leaving one blind and the other with part of her upper eyelid missing, both were in need of surgery. Veterinary Ophthalmologist Doctor Cassandra Bliss and Doctor Tami Rogers will perform the surgeries Friday morning, at no cost to C.A.T.S." Dr. Bliss has been in the news a bit lately over a delightful story around two sweet sibling kittens that needed surgery. A pair of abandoned kittens are recovering at the Jacksonville Animal Hospital after the staff performed a few special procedures for free. The Committed Alliance to Strays or C.A.T.S. works with the Jacksonville Animal Hospital to spay and neuter cats they rescue. The animal hospital has performed hundreds of operations for the organization for free. When brother and sister kittens were found abandoned in Decemeber, C.A.T.S. noticed the kittens had abnormalities in their eyes. The kittens suffer from a rare condition where they were born without 80 percent of their eyelids. Southern Oregon’s only Certified Veterinary Ophthalmologist, Cassandra Bliss, performed two free surgeries on the kittens on Friday. The team started with the girl. Stormy is a very special patient that had cataract surgery with Dr. Bliss. Enjoy her video on You Tube! As an avid upland hunter with my owner hunting dogs, it is important for you to know how to care for your gun dogs eyes. Gun dogs are constantly in an environment prime for eye injury. Dogs’ eyes can attract all sorts of debris due to running through weeds, brush, and grass while hunting. It is essential that we observe and care for our hunting partners’ eyes to ensure they remain in the best of health. This may include rinsing the eyes with saline after a day of hunting and watching for signs of irritation or discomfort. This article will help you navigate the best way to watch and monitor your gun dog. So how do you monitor your dog before, during, and after hunting? Start by looking at your dog in a brightly lit area. You should see that the eyes are clear and bright. The whites around the eyes should be white, not pink or red. The pupils should be equal in size and there should be no tearing, discharge, or crusts around the eyes. Open the eyelids by gently rolling them out and looking in the “pockets”. This pocket is the conjunctival fornix – the space between the eye and the conjunctiva of the eyelid. This tissue should be pink, not red or white. These pockets can hold debris and if present should be rinsed with a stream of saline. Saline rinse can be purchased over the counter at any grocery store or pharmacy (Example: OcuSoft Eye Wash). Get in the habit of opening your dogs’ eyes and checking these “pockets.” This will help you recognize when they are red and irritated versus a normal pink appearance. The more you handle your dogs’ eyes and eye area, especially when they are young, the easier it will be to treat them if an injury should occur. Make it fun when they are young. Teach them to quietly sit (Flushers) or stand (Pointers) while you look at and examine their eyes. Reward them with treats or follow it with playing fetch. Now that you know what to monitor, it is important to distinguish irritation from injury. Irritation can occur due to an accumulation of seeds or dust inside the eyelids. With irritation you may note a mild increase in redness or mild tearing, but this should last no more than 24 hours after it is first noted. Injury on the other hand is painful. Eye pain in dogs is characterized by squinting, tearing, and redness. You may also note that the third eyelid is raised. Anytime your gun dog holds their eye(s) closed (even just partly) and will not open them normally, it is essential that you seek a veterinarian examination. Injuries to the eye can be devastating if not quickly diagnosed and treated appropriately. Other signs to watch for that indicate the need for an eye exam by your veterinarian include: changes in eye color, cloudiness, unequal pupil sizes, discharge, and tear staining. Persistent rubbing at the eyes is often a sign of an eye problem and should be evaluated. Also remember that on the drive out to that perfect hunting spot, avoid having your gun dog hang their head outside the car window. Although they may love the open road and wind in their face, this predisposes the eyes to drying out as well as debris and insects hitting their eyes. Lastly, do your research and know if your gun dog breed of choice may have predispositions to eye conditions such as dry eye, glaucoma, or progressive retinal atrophy. Annual eye exams with your veterinarian are important and combining that with the knowledge of possible inherited problems will help you take important precautions.